Component of the Parameter Set Neuroleptics 1/EXTENDED, available separately. These lyophilised calibrators from Chromsystems are based on human plasma and should be used according to the instruction manual. 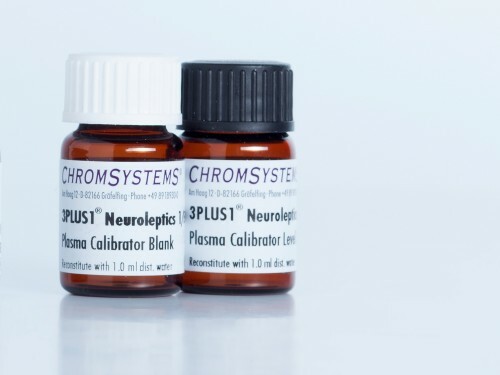 They are designed to calibrate the measurement method in clinical diagnostics for the quantitative determination of neuroleptics 1/Extended in serum/plasma. While following the instructions the calibrators should be handled and measured in the same manner as a patient specimen. Aripiprazole 10.5 193 660 n.d.
Dehydroaripiprazole 6.93 91.8 262 n.d.
Clozapine 75.6 444 1186 n.d.
N-Desmethylclozapine 70.7 192 444 n.d.
Haloperidol 1.99 15.9 30.7 n.d.
Olanzapine 3.96 48.7 143 n.d.
N-Desmethylolanzapine 4.06 50.2 159 n.d.
Quetiapine 7.60 188 565 n.d.
Norquetiapine 10.3 158 314 n.d.
Risperidone 1.85 11.6 29.6 n.d.
9-OH-Risperidone 4.45 58.3 168 n.d. Stored below -18 °C and unopened, the lyophilised calibrators are stable until the expiry date specified on the vial labels. The reconstituted calibrators can be stored in glass containers up to 3 days light protected and tightly capped at +2 to +8 C. If the calibrators cannot be used within this period, they should be aliquoted and stored frozen below -18 °C (up to 3 months). For more details about storage conditions please check your instruction manual.